Hey that rhymes! 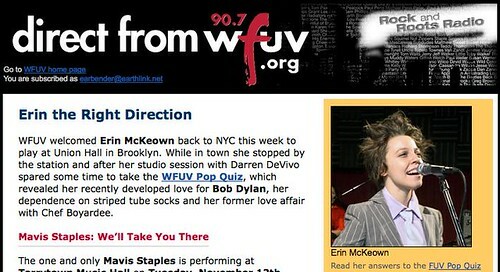 But I actually didn’t know it until this week, when I first heard Darren DeVivo utter the name Erin McKeown on New York’s WFUV. I guess this says a bit about who I hang with and what we talk about, since the Righteous Babe recording artist has been on the scene for a while now. Nevertheless, how to pronounce “McKeown” was one of those brain teasers that would not quit until this week! Thanks Darren saying “Erin Mc-YON” over and over, I’ll never have this problem again. Like Dale Carnegie making a sale, ‘FUV hit me numerous times this week: Darren playing the record, promoting his studio session, back-announcing, and doing it again. When I received the “Direct from WFUV” email with Erin at the top, I couldn’t help but click through to read about her in the Pop Quiz. Nice job WFUV! Erin McKeown is a great artist to support and the science of how you did it to me this week was very effective and tastefully executed. There must be hundreds of other folks who feel the same way. Click this image to sign up for WFUV's eblast today!